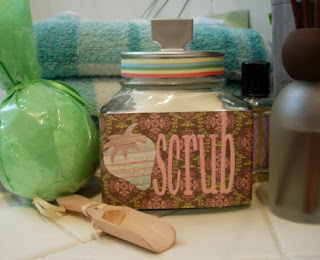 Make your own sugar bath scrub and personalized bath jar with this tutorial. This combination makes a lovely gift for Mother's Day or any special occasion. This is a quick and easy project! Mix bath scrub ingredients in bowl (recipe below) and scoop into jar. Replace lid. Clean outside of jar completely to remove any overspill residue. Set aside. Using your Big Shot and dies, cut lettering and strawberry. Measure and cut background paper to size to fit around glass jar overlapping seam at back. Mark front center. Lay background paper face up on flat work surface. Using front center mark to guide placement, glue lettering and strawberry onto background paper. Wrap paper around jar and glue or tape to hold. Measure, cut and glue ribbon to jar of lid. Wrap up for a special gift. Be sure to include a hand-lettered tag listing the sugar scrub ingredients! Mix equal parts white cane sugar and almond oil (you can also substitute with avocado oil or olive oil). Add equal drops of lavender essential oil and orange essential oil (or essential oils of your choice). Mix together in bowl and scoop into jar. When ready to use scrub, use a wooden scoop or popsicle stick to scoop contents from jar. Keep jar tightly sealed between uses.